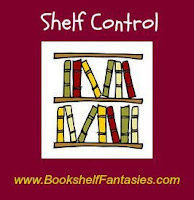 Shelf Control hosted by Lisa of Bookshelf Fantasies "is all about the books we want to read — and already own! Consider this a variation of a Wishing & Waiting post… but looking at books already available sitting right there on our shelves and e-readers." England flourishes under the hand of its Virgin Queen: Elizabeth, Gloriana, last and most powerful of the Tudor monarchs. But a great light casts a great shadow. 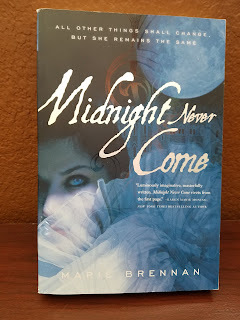 A breathtaking novel of intrigue and betrayal set in Elizabethan England; Midnight Never Come seamlessly weaves together history and the fantastic to dazzling effect. Why I want to read it: I love the genre and novels featuring the fae. Not to mention Marie Brennan is an author I have been wanting to read for ages now. Her books come highly recommended, and I love the sound of them. Have you read this book? If so, what did you think? Should I move it up in my TBR pile? Tracy - It does sound, good doesn't it? I really need to move this one up in my TBR pile. The blurb makes the book sound fantastic! I hope you get a chance to read it soon! Eustacia - I agree! I still am wondering why I haven't yet read this one. I enjoyed Brennan's The Natural History of Dragons, but haven't read anything else by her. Jenclair - That's another of hers I want to read. I don't think I have a copy though. Oh yes! I would recommend this one. I enjoyed it and have reviewed it. My only caveat is that you'll appreciate it more if you have a reasonable grasp of Elizabethean history. Sarah - I am glad to hear you enjoyed this one! And thank you for the head's up about the book in relation to Elizabethan history. That's good to know going in. I haven't heard of this book before but I love stories about the fae and royalty so it is a double win. Hope you get a chance to read it soon. Carole - Me too! I hope I get to read it soon as well. Haven't read any of her books but I do love that cover! I need to do more of these Shelf Control posts as it's a good reminder to read more from my stacks! Iliana - Isn't it beautiful? I really like the cover too. I have read this, really liked it... Still have not read the sequels. I am so bad for that! Kelly - I am glad you liked this one. I noticed it is a series. I am bad about keeping up with series too. I have the best intentions at least. Lark - I know, right?! It sounds so wonderful. I hope you do get a chance to read it. And hopefully I will too soon. Oh, this book is right up my alley, Wendy!! What an original and exciting concept!! I'm adding this novel to my Goodreads shelves right away!! Thanks for featuring it!! Maria - One good thing about this feature is renewing my excitement about the books already on my shelf. This one sounds so good. If you read it, I hope you like it. I haven't heard of this book but it sounds interesting! Thanks for sharing, Wendy. Melody - Too many good books just languishing on my shelves. It doesn't seem fair, does it? I have zero shelf control myself...lol...and Midnight Never Come sounds good!